It is very easy to warm up a can of tomato soup in the caravan but why not try making your own. The vibrancy of the colour is a feast for your eyes, the alluring aroma tantalizes your taste buds and then, finally, that oh so fresh taste satisfies you in a way no tin of soup ever could. 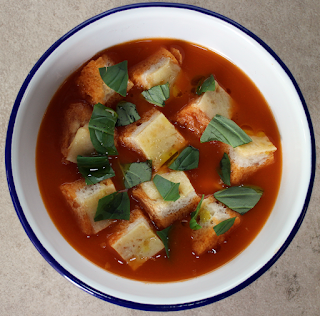 As we were on the Isle of Wight, where arguably the best British tomatoes come from, we just had to make tomato soup (with maybe just a little bit of IoW garlic in it too). 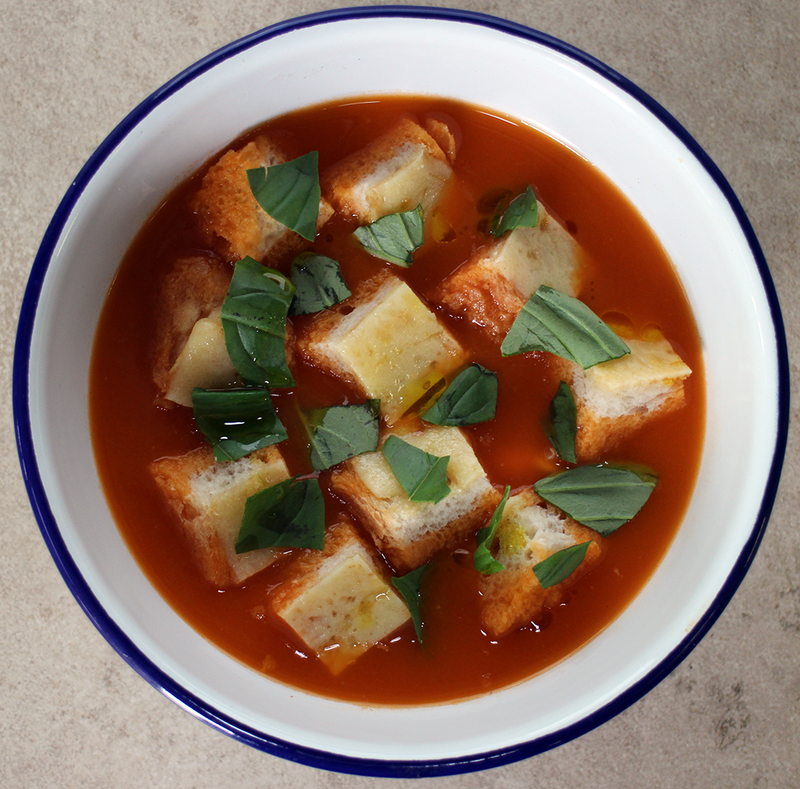 Little Larry and I made this one together as he loves tomato soup, it's such an easy recipe to get kids cooking and understanding the flavours that go into their food. 1. In a saucepan gentle fry the onion until it is translucent. 2. Add the carrot, celery and garlic to the pan and stir well. 3. Add the tomato puree, stir well and cook for a minute. 4. Chop up the parsley stalk but retain the leaves. Chuck the chopped stalk into the pan. 5. In goes the flour, stir and cook for a minute. 6. Pour in about a quarter of the water. 7. Tomatoes time, in they go. 8. Pour in the rest of the water. 9. Crumble in the stock then simmer with a lid on for about 1 hour. 10. Whiz it all up with a hand blender then pass through a sieve into a clean pan. 11. Season with lemon juice, salt and pepper. 12. Serve! We made some cheese on toast croutons and topped with torn basil leaves and a splash of nice oil. Tip: For a more intense flavour try roasting the tomatoes and garlic first. You can also add a chilli if you like it spicy.